Cyclone Debbie is tracking towards the Queensland coast and is expected around midday, based on this latest update. UPDATE: CYCLONE Debbie is now expected to make landfall late Tuesday morning after becoming a Category 4 system with wind gusts of up to 260 kilometres per hour. In a 4am update, the Bureau of Meteorology said the Category 4 sustained winds near the centre of 175 kilometres per hour with wind gusts to 250 kilometres per hour. It was estimated to be 105 kilometres east northeast of Bowen and 75km north northeast of Hamilton Island. It was moving west southwest at 10 kilometres per hour, speeding up from about six kilometres an hour earlier in the night. It is forecast to make landfall between Ayr and Midge Point at noon. 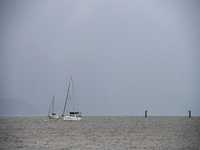 The bureau said the very destructive core of Cyclone Debbie was starting to impact the Whitsunday Islands. Wind gusts of up to 260km/h are expected at the centre of the cyclone when it crosses the Queensland coastline. The warning zone includes Lucinda to St Lawrence, including Townsville, Mackay, and the Whitsunday Islands, extending inland to Charters Towers, Mount Coolon, Moranbah, and Pentland. Senior BOM forecaster Brett Harrison told ABC Emergency the delayed arrival of the cyclone could help. "The crossing time should mean that the storm tide peak won't quite be as bad, but certainly we're expecting inundation of low-lying areas." Peak tides are expected at 9am - so the later Debbie makes landfall, the lower the peak should be. However, Mr Harrison warned widespread heavy rainfall of more than 150 millimetres and up to 400 millimetres was still expected. Cyclone Debbie recorded winds near the centre of 175 kilometres per hour with wind gusts to 250 kilometres per hour. "Severe tropical cyclone Debbie is currently a category 4 cyclone. It may intensify further as it continues to move west-southwest towards the Whitsunday coast this morning. Severe tropical cyclone Debbie is forecast to make landfall between Ayr and Cape Hillsborough (north of Mackay) late this morning." "The very destructive core is forecast to cross the coast between Ayr and Cape Hillsborough (north of Mackay) late this morning with wind gusts potentially to 260 km/h near the centre of the system." The bureau has warned the system "may intensify further as it continues to move west-southwest towards the Queensland coast this morning". The times when it is expected to cross land have varied between 10am and midday. Heavy rainfall associated with Severe Tropical Cyclone Debbie is expected to result in widespread 24 hour totals of 150 to 250mm overnight and into Tuesday, the bureau says. Based on the forecast rainfall, the Pioneer River at Mirani is likely to exceed the minor flood level (6.00 m) overnight with further rises to the moderate flood level (8.0 metres) likely Tuesday morning. The Pioneer River at Mackay is currently at 4.6 metres and rising due to the tide. Based on the forecast rainfall, river level rises greater than the minor flood level (7.0 metres) are likely at Mackay during Tuesday morning with further rises to the moderate flood level (8.0 metres) possible depending on the timing of the flows in the river, high tide and storm surge. Mackay residents have been told the evacuation centres are closed until the morning, but the cyclone shelter on Rosewood Drive is still open. Police have asked residents to seek shelter with family or friends who are not in evacuation areas as space at the shelter is limited and is for people who have no other option. The Queensland Premier Annastacia Palaszczuk said it was going to be a 'very long night' for a large number of Queensland families. Bureau of Meteorology has told ABC News it can't rule out #CycloneDebbie becoming category 5 before it hits. An estimated 25,000 people in Mackay alone were urged to evacuate low-lying areas amid fears of a massive tidal surge. 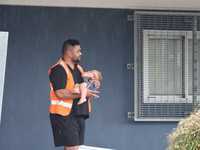 "It's going to be a tough night, but I also want to reassure you that in the daybreak, once the storm has passed, we have emergency personal ready to assist … you and your families,'' the Premier said. "It could take many hours, the BOM has even advised us it could take up to 18 hours for this core to pass. "I want everyone to be safe. Everyone please do not go outside, don't risk it. "Don't risk your life or risk the life of a loved one. Stay indoors. "This is a destructive cyclone, make no mistake." In it's official advice, the bureau said the very destructive core of tropical cyclone Debbie is forecast to cross the coast between Ayr and Cape Hillsborough (north of Mackay) late this morning with wind gusts potentially to 275 km/h near the centre of the system. Destructive winds with gusts over 125 km/h were already being felt about the Whitsunday Islands, and will extend further to the exposed coast and islands between Ayr and Mackay later this morning. These winds may extend further northwest along the coast to Townsville and to adjacent inland areas, including Collinsville and Charters Towers, and Mount Coolon during the day today. Gale-force winds were being felt on the Whitsunday coast and south to Mackay. "These gales are expected to extend to the remaining coastal and island areas between Townsville and St Lawrence later this morning. "Gales could potentially extend further northwest to Lucinda and further inland to locations such as Charters Towers, Pentland, Mount Coolon, and Moranbah today. "Residents between Ayr and St Lawrence are specifically warned of the dangerous storm tide as the cyclone crosses the coast late this morning,'' the bureau advice said. "The sea is likely to rise steadily up to a level well above the normal tide, with damaging waves and flooding of some low-lying areas close to the shoreline as the cyclone approaches the coast today. "Large waves may also develop along the beachfront. People living in areas likely to be affected by this flooding should take measures to protect their property as much as possible and be prepared to follow instructions regarding evacuation of the area if advised to do so by the authorities. "Areas of heavy rain with the potential to cause severe flash flooding have developed around the central coast and Whitsundays district and are expected to spread to other parts of the northern and central Queensland coast and adjacent inland areas tonight and continue through today. "Widespread daily rainfall totals of 150 to 250 mm, with isolated event totals of 500 mm, are also likely to lead to major river flooding over a broad area this week, and a Flood Watch is current for coastal catchments between Rollingstone and Gladstone, extending inland to the Upper Flinders, Thomson and Barcoo catchments. TC Debbie still tracking west towards Bowen but has slowed considerably. For the last few hours the cyclone, that was tracking towards Mackay, has turned westerly and looks to be making landfall close to Bowen. But the system is crawling along at 7kmh. The main concern for coastal areas in Mackay is it that it has slowed and is forecast to make landfall during a 5.9m high tide. Mackay Regional Council mayor Greg Williamson said the emergency management committee was prepared for a storm surge at high tide, hence the voluntary evacuation of 25,000 people in low lying areas. UPDATE: Tropical Cyclone Debbie is now a category 4 system and is still tracking to cross the Queensland coast south of Bowen. With many Mackay residents expected to flee low-lying areas, authorities are urging for calm on the roads. There is growing angst among emergency services personnel that a stampede of evacuees expected to flee their homes could bring chaos to the city's roads and highways. Mackay residents in green, red and orange zones in Mackay and associated beaches are being urged to "prepare and act" for possible inundation Monday night and Tuesday morning. Mackay residents in those low-lying areas are urged to follow advice to evacuate, but evacuees should "not lose sight of road safety" during the rush. Strong gale force winds have hit Mackay and they are expected to intensify through the night. Mackay Regional Council mayor Greg Williamson will speak shortly on what emergency services can expect in the next few hours. UPDATE: THE latest information from the Bureau of Meteorology is that Tropical Cyclone Debbie will make landfall at 10am tomorrow. EARLIER: POLICE and emergency services have doubled down on earlier evacuation orders as Tropical Cyclone Debbie continues on its path towards the Queensland coast. "Emergency Alerts have been issued by Mackay Regional Council directing residents in the Green and Red zones in the areas of: North Pioneer; South Pioneer; Louisa Creek; Armstrong's Beach; Dunrock; Ball Bay; Freshwater Point; Grasstree; Half Tide and Seaforth, to evacuate immediately," Queensland Police said via a statement. "Council advised of a storm tide warning on Monday evening and Tuesday morning. "Check the Mackay Regional Council Facebook page and listen to the radio for further information or phone 07 4951 2466." Earlier the Buruea of Meteorology warned winds from the cyclone could reach up to 260km/h at the system's core with winds upwards of 125km/h expected in Mackay later tonight. EARLIER: THE Queensland Government is urging people fleeing Cyclone Debbie to take care on the roads. Earlier this afternoon Police Commissioner Ian Stewart urged residents who had been ordered to evacuate to get in their cars and drive south. Main Roads and Road Safety Minister Mark Bailey said while it was important affected residents take the evacuation advice seriously, they should not lose sight of road safety. 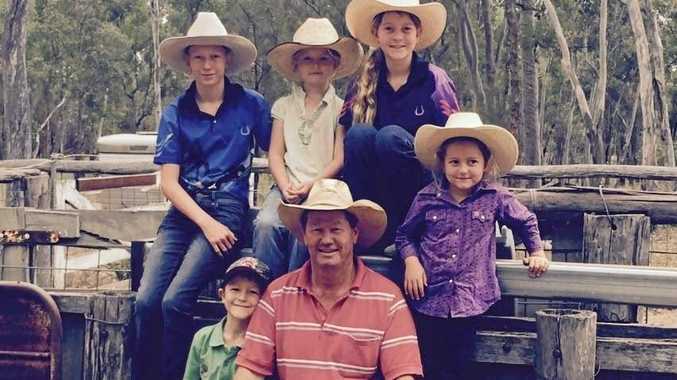 "A female tourist has already lost her life in a two-vehicle crash near Proserpine this morning, we don't want to see this happen again," Mr Bailey said. "I am urging residents to pay heed to advice from police and emergency services but also to appreciate the importance of driving to conditions and planning their trip. "The last thing we want is a needless and avoidable tragedy on our roads adding to the risk already posed by the cyclone." "If you have to drive, it is important to reach your destination safely by ensuring you obey all traffic and road signs. "While we strongly advise residents to make arrangements to stay with friends or family who have addresses on high ground I also urge you to take care getting there." Residents in Mackay are being urged to check storm tide inundation maps on the council's website and Mr Bailey said emergency text alerts had been sent to residents in the green, orange and red zones who have been advised to prepare and act, at this stage. 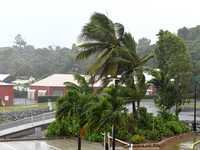 EARLIER: THE latest update from the Bureau of Meteorology says winds have already hit gale force strengths in the Whitsunday Islands. 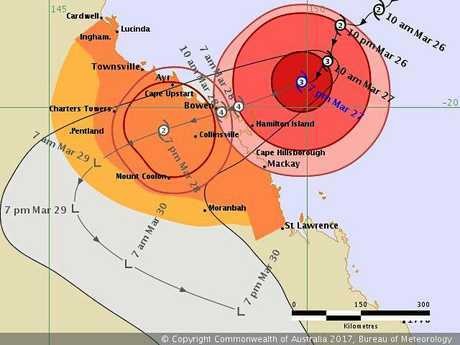 The news comes as about 25,000 Mackay residents are being urged to evacuate as Tropical Cyclone Debbie sits about 205km east, nor-east of Mackay. The gale force winds are expected to impact the area around Mackay this evening. The BOM's most recent update stated gale force winds had been detected in the Whitsunday Island and are expected to extend into inland areas such as Charters Towers, Pentland and Mount Coolon throughout tonight and early tomorrow. "Destructive winds with gusts over 125 km/h may develop about the exposed coast and islands between Cape Upstart and Mackay during the remainder of the afternoon and evening," the BOM update read. "These destructive winds may extend further northwest along the coast to Townsville overnight and during Tuesday and to adjacent inland areas, including Collinsville, during the day on Tuesday. "The very destructive core of tropical cyclone Debbie is forecast to cross the coast between Ayr and Cape Hillsborough north of Mackay on Tuesday morning with wind gusts potentially to 260 km/h near the centre of the system. "Residents between Cape Upstart and St Lawrence are specifically warned of the dangerous storm tide as the cyclone crosses the coast on Tuesday morning. "The sea is likely to rise steadily up to a level well above the normal tide, with damaging waves and flooding of some low-lying areas close to the shoreline as the cyclone approaches the coast on Tuesday. Large waves may also develop along the beachfront. "People living in areas likely to be affected by this flooding should take measures to protect their property as much as possible and be prepared to follow instructions regarding evacuation of the area if advised to do so by the authorities." People between from Bowen to Sarina, including the Whitsunday Islands should complete preparations quickly and be prepared to shelter in a safe place. - Boats and outside property should be secured using available daylight hours. People between Cardwell and St Lawrence, and inland to Collinsville and Charters Towers, should immediately commence or continue preparations, especially securing boats and property. People inland of Lucinda to Mackay including Pentland and Mount Coolon should consider what action they will need to take if the cyclone threat increases. EARLIER: POLICE commissioner Ian Stewart has urged about 25,000 Mackay residents to evacuate. Areas depicted in in orange, red and green low lying areas, on the storm tide inundation maps on the Mackay Council website are being told to evacuate now. These areas include: North Pioneer; South Pioneer, Louisa Creek, Armstrong's Beach, Dunrock, Ball Bay; Freshwater Point, Grasstree, Half Tide, Seaforth, and Midge Point. Commissioner Stewart said Queensland Police had never moved towns of this magnitude before. "BOM tells us that the range of inundation may be up as much as 0.8m from high tide to 2.5m about high tide," he said. "We're asking people that can move out of those lying areas on the council website to move now, don't wait until because you won't be able to move probably after midnight tonight. He even encouraged people to get into their cars now and drive south, as far as Rockhampton if they could. Premier Annastacia Palaszczuk urged the families in Mackay to move because of the intensity of the cyclone. "Evacuations are underway in Mackay, I have taken advice from the State Disaster Coordinator and the time for people to move is now, this is a severe weather system," she said. The Bureau of Meteorology advises the system is presently a Category Three Cyclone. Commissioner Katarina Carroll said although the latest cyclone tracking map indicated Severe Tropical Cyclone Debbie had moved south, residents in areas outside pf the evacuation zone should not be complacent. "Conditions have now deteriorated in some of the cyclone warning areas and soon it will be too late to leave your home," Ms Carroll said. "If an official evacuation order has not been issued for your area, the best option is to stay indoors and shelter in place until the cyclone has passed. "As the cyclone approaches, turn off all your electricity, gas and water and unplug all appliances, bring your family to the strongest part of the house and ensure your emergency kit is close by. "If the building you're sheltering in begins to break up, immediately seek shelter under a strong table or bench or under a heavy mattress." PREMIER Annastacia Palaszczuk, the State Disaster Coordinator Deputy Commissioner Steve Gollschewski and the Queensland Fire and Emergency Services Commissioner Katarina Carroll will address the media shortly. The briefing will be live streamed and can be viewed below. The briefing comes as Queensland Police add to a previous storm tide warning. "Emergency Alerts for a storm surge have been issued by Mackay Regional Council for the areas of: North Pioneer; South Pioneer; Louisa Creek; Armstrong's Beach; Dunrock; Ball Bay; Freshwater Point; Grasstree; Half Tide and Seaforth," Police said via a statement. "Council has advised of a storm tide warning which may impact the Green, Red and Orange zones on Monday evening and Tuesday morning. "Residents are advised to prepare and act for inundation of properties located in the evacuation zone. Check the Mackay Regional Council Facebook page and listen to radio for further information or phone 07 4951 2466." BUREAU of Meteorology has told Mackay residents to prepare for a dangerous storm tide as the cyclone crosses the coast on Tuesday morning. The latest advice on Cyclone Debbie released by the bureau at 3pm states that the "sea was likely to rise steadily up to a level well above the normal tide, with damaging waves and flooding of some low-lying areas close to the shoreline as the cyclone approaches the coast on Tuesday". "People living in areas likely to be affected by this flooding should take measures to protect their property as much as possible and be prepared to follow instructions regarding evacuation of the area if advised to do so by the authorities," the bulletin reads. Cyclone Debbie has also picked up its speed, earlier this morning it was travelling at 5kmhr but as of 2pm it was travelling at 10kmhr. THE council has released emergency alerts for a storm surge for the areas of: North Pioneer; South Pioneer; Louisa Creek; Armstrong's Beach; Dunrock; Ball Bay; Freshwater Point; Grasstree; Half Tide and Seaforth. Council has advised of a storm tide warning which may impact the Green, Red and Orange zones on Monday evening and Tuesday morning. Crown Apartments on River St at Mackay has evacuated its residents from the building with the power being cut off at the lift at 3pm, because it is in the Green Zone. People living on boats at the Marina have also been evacuated. Residents have been advised to prepare and act for inundation of properties located in the evacuation zone. 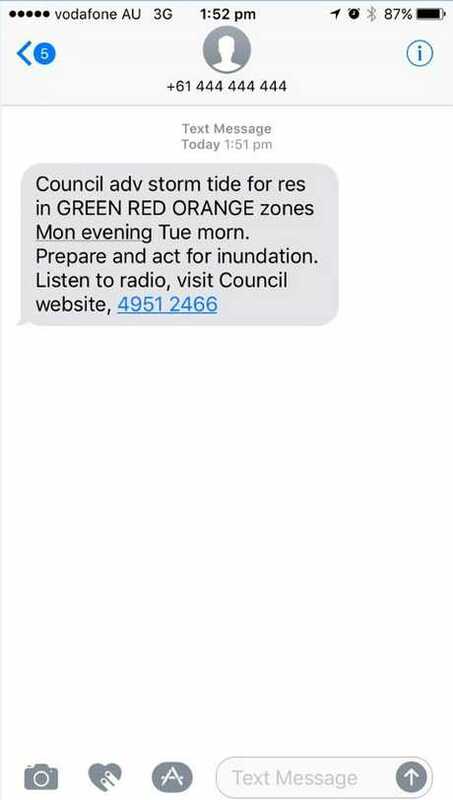 MACKAY Regional Council has sent out text messages to residents telling people to get ready to be inundated with water as a result of storm tides. The warning is for residents in the Green, Orange and Red Zones. Some of the Greens Zones include areas of Paget, South Mackay, East Mackay, Bucasia, Shoal Point, Dolphin Heads, Blacks Beach and Mackay Harbour. "Prepare and act for inundation. Listen to radio, visit council website," the warning reads. Mr Crock warns that for those along the coast, the rain and the wind cannot be underestimated, but they may not be the most dangerous part of the storm. "The risk of a storm surge, that could be a significant impact," he said. "Emergency services are saying you can shelter from the winds but on the coast you can't shelter from a storm surge - it's water coming up over the beach and flooding the coastal strip." As of lunchtime on Tuesday, Cyclone Debbie was due to strike land between Cape Hillsborough, north of Mackay and Ayr early on Tuesday. THE outer band of Cyclone Debbie has hit Mackay and could be the start of 24 hours of gale force winds and heavy rain for the region. Sky News Chief Meteorologist Tom Saunders said the temperature in Mackay has dropped by two degrees, there has been 14mm of rain in 15 minutes and wind gusts of up to 70kmhr. "This is the outer band of the cyclone hitting Mackay. This is the first direct impact that Mackay has seen from this system," he said. Mr Saunders said the track has moved more to the south south-west which is why the whole system is now closer to Mackay. "The forecast track still shows a right hand turn on Monday, the most likely track is somewhere near Bowen or Ayr," he said. He said Cyclone Debbie is a small cyclone about 300km wide but was travelling slowly. "The entire radius is about 300km, it puts it as a small tropical cyclone, small tropical cyclones can still have extremely high winds speeds in the centre," he said. "Cyclone Tracey was one of the smallest tropical cyclones on record but it was a high end category four system." To ensure unrestricted access to vital Cyclone Debbie information, we have removed our paywall from this site. This will be in effect for the next 48 hours and will allow unmetered access to all of our content until lunchtime on Wednesday. We would encourage readers to follow the topic Cyclone Debbie here for the latest information. We will also continue to provide updates on our Facebook site and through our breaking newsletters. If you have cyclone information, photos or videos that should be shared with the wider community you can email us here. RAIN has just whacked the centre of Mackay with solid lines of water running horizontally up the street. There hasn't been much rain so far on Monday with only 5.6mm recorded at the Mount Bassett Weather Station from 9am to 12.13pm. But from 12.13pm to 12.30pm there has been a further 16.4mm. That works out to be almost a millimeter of rain each minute. SEVERE Tropical Cyclone Debbie has recently strengthened into a category 3 system, and is expected to intensify further as it continues to move west-southwest towards the Queensland coast today. 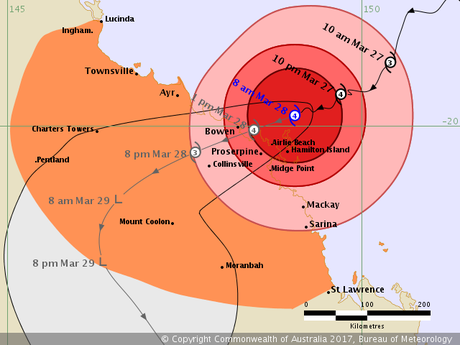 Severe Tropical Cyclone Debbie is forecast to make landfall as a severe tropical cyclone between Ayr and Cape Hillsborough, north of Mackay, on Tuesday morning. Gales are now occuring about the Whitsunday Islands, and are expected to extend to the exposed coast and islands elsewhere between Ayr and Mackay this morning and early afternoon. Gales could extend to remaining coastal and adjacent inland areas between Townsville and St Lawrence later today before potentially extending further north to Cardwell and further west to inland locations such as Charters Towers, Pentland and Mount Coolon on Tuesday. Destructive winds with gusts over 125 km/h may develop about the exposed coast and islands between Cape Upstart and Mackay during the afternoon. These destructive winds may extend further north along the coast to Townsville overnight and during Tuesday and to adjacent inland areas, including Collinsville, on Tuesday. Cyclone Debbie storm surge: The latest information on the expected storm surge from Cyclone Debbie. The very destructive core of tropical cyclone Debbie is forecast to cross the coast between Townsville and Mackay on Tuesday morning with wind gusts potentially to 240 km/h near the centre of the system. Residents between Cape Ferguson and Mackay are specifically warned of the dangerous storm tide as the cyclone crosses the coast on Tuesday morning. The sea is likely to rise steadily up to a level well above the normal tide, with damaging waves and flooding of some low-lying areas close to the shoreline as the cyclone approaches the coast on Tuesday. Large waves may also develop along the beachfront. People living in areas likely to be affected by this flooding should take measures to protect their property as much as possible and be prepared to follow instructions regarding evacuation of the area if advised to do so by the authorities. Areas of heavy rain with the potential to cause severe flash flooding are expected to develop about parts of the northern and central Queensland coast and adjacent inland areas later today and continue through Tuesday. Widespread daily rainfall totals of 200 mm, with isolated falls of 400 mm, are also likely to lead to major river flooding over a broad area next week, and a Flood Watch is current for coastal catchments between Cardwell and Gladstone, extending inland to the eastern Gulf River catchments. PREMIER Annastacia Palaszczuk has revealed Cyclone Debbie is continuing to track south after a full briefing with Bureau of Meteorology, Police and more than 10 mayors. "We are already seeing wind gusts up to 100kmhr and Whitsunday region and around Proserpine," she said. "It's going to get worse through the day. "My messages to those families around the areas where winds are about to pick up, please be stay safe, stay off the roads, stay in a safe place with your families and your friends." She said already 3500 residents have already evacuated from the Homehill area down to Proserpine and extended the area to Bowen have also been asked to evacuate. "In relation to power, we have over 800 people form Energy Queensland to help restore power. Power will be going off, now is the time to charge your phones to be ready for when the power goes out," Premier Annastacia Palaszczuk said. "Make sure your torches have batteries, make sure you have enough food, water and medication, make sure you have that medication with you." SOME relatively good news on Cyclone Debbie - instead of intensifying overnight the tropical cyclone actually weakened. Sky News Chief Meteorologist Tom Saunders said the cyclone had wind gusts in the centre of 240kmhr on Sunday night and this morning it had weakened to 230kmhr. "It's 100% good news," Mr Saunders said. "It's a downgrade from yesterday, Debbie has weakened overnight, pressure rose overnight slightly and gusts dropped by 10kmhr." He said despite overnight weakening the conditions were still suited for the cyclone to increase its intensity. "We have very warm ocean temperatures, about 2 degrees warmer than usual, we have low vertical wind shear and out flow, the conditions are ideal for further intensification," he said. As for when the cyclone would hit the coast, Mr Saunders said its timing was the worrying factor. "That does unfortunately coincide with high tide, roughly 9am, and expected to bring a storm surge. "With a high end tropical cyclone the main threat is a storm surge." He said the storm surge was expected to be worse on the southern side of the cyclone because the winds were onshore. "Water levels should be at least a metre above the highest tide of the year," he said. Mayor Greg Williamson said while the disaster management committee was planning for the worst case scenario, the cyclone directly hitting Mackay, the major threat with the current modelling was falling trees and flash flooding. It was his main concern with the current tracking of the Cyclone Debbie landing on Tuesday morning just south of Ayr. The cyclone would then bring destructive winds and a predicted 310mm of rain on Monday. With 40mm falling on Sunday and more than 200mm last week, Cr Williamson said the ground was already soaked through. He said with the high winds and wet ground, it was a real risk that trees could be blown over.